UPDATE: THIS PRE-ORDER OFFER HAS ENDED! THE FINAL SIX is now officially on sale! Thank you to everyone who participated in this pre-order offer. Your gift packs are scheduled to go out in late March/early April, once we’ve had a chance to review all of your submissions. Additionally, the grand prize winner will be announced on this page and my social media accounts later this month. Stay tuned! Don’t be sad if you missed out on this offer, because I have a special treat for you! I’ve teamed up with Royal Digital Studio on Instagram for an exclusive Release Giveaway!!! Click here to learn how you can enter to win a bunch of signed books & amazing FINAL SIX themed prizes! *This Pre-Order Offer has been EXTENDED THROUGH 3/10 exclusively for my newsletter subscribers! Plus, when you subscribe to my newsletter you will automatically be entered in my quarterly giveaway. Simply fill out the form below to receive your instructions. Also, make sure to follow me on Instagram for more opportunities to win! 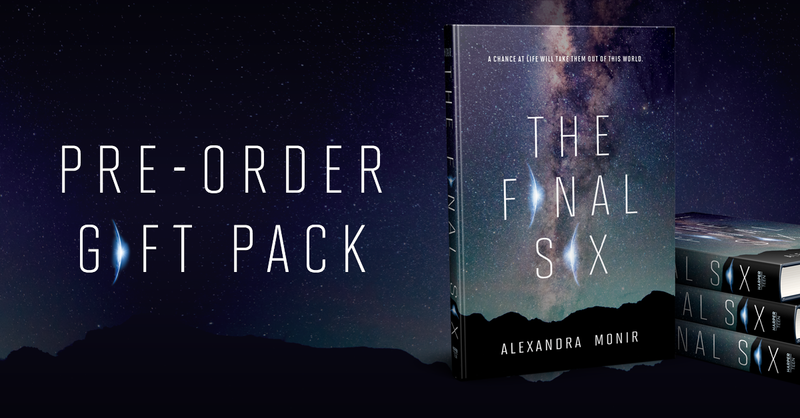 Pre-order a copy of THE FINAL SIX to receive an exclusive gift pack! Plus, U.S. participants will be entered for a chance to win a visit from the author!!! For Leo, an Italian championship swimmer, this kind of purpose is a reason to go on after losing his family. But Naomi, an Iranian-American science genius, is suspicious of the ISTC and the fact that a similar mission failed under mysterious circumstances, killing the astronauts onboard. She fears something equally sinister awaiting the Final Six beneath Europa’s surface. In this cutthroat atmosphere, surrounded by strangers from around the world, Naomi finds an unexpected friend in Leo. As the training tests their limits, Naomi and Leo’s relationship deepens with each life-altering experience they encounter. But it’s only when the finalists become fewer and their destinies grow nearer that the two can fathom the full weight of everything at stake: the world, the stars, and their lives. As I prepare to release my fifth novel into the world, I’m filled with gratitude for each one of you. By reading my stories, you bring them to life. Your emails, tweets, and creativity inspire me every day, and your support is the reason my novels keep landing on bookstore shelves. And now, I couldn’t be more thrilled to share my latest with you, THE FINAL SIX—the book nearest and dearest to my heart. Since this book is so special to me, I wanted to offer something equally special to you, the readers I love, as a thank-you for pre-ordering. 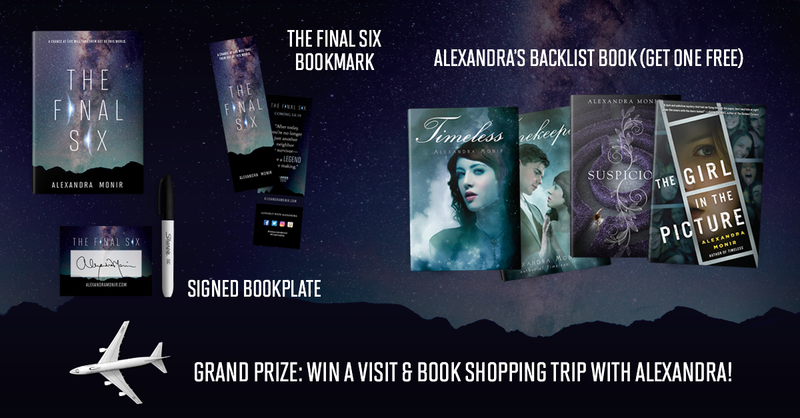 That something is a pretty epic gift pack that includes a FREE signed copy of one of my backlist novels and a handful of FINAL SIX themed goodies (details below). That’s two books for the price of one! Pre-orders and first-week sales are the most crucial barometers of a book’s success, just as “opening weekend” is to a film. 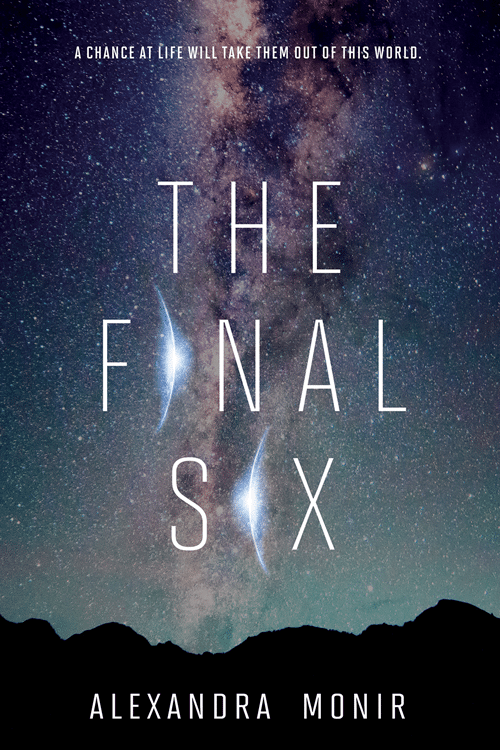 If you’re thinking of reading THE FINAL SIX, or if it could make a good gift for a reader in your life, I would be SO grateful if you would pre-order. After you’ve placed your order, don’t forget to submit your proof of purchase below so you can receive your FREE book and other prizes! Much Love & Happy Reading! A limited edition FINAL SIX bookplate signed by the author (to stick inside your book, turning it into a signed copy!). *While supplies last. Quantities are limited and will be sent on a first-come-first-serve basis. A limited edition FINAL SIX bookplate signed by the author (print it, cut it, and stick it inside your book, turning it into a signed copy!). A printable FINAL SIX bookmark. Two lucky participants will have a character named after them in Alexandra’s next book! All you have to do is subscribe to Alexandra’s newsletter and you’ll be automatically entered for a chance to have a character named after you!!! Simply check the box located at the bottom of the form below to subscribe. *Note: If you are already a subscriber and would like to participate, please check the box below. You will automatically be entered, but you will not be added to the mailing list twice. We only need your shipping address if you live in the United States. If you live outside of the U.S., you'll receive your digital gift via email. Please upload a copy of your receipt (screenshot, photo, scan). Make sure your receipt displays your name, the store, order #, and book. Accepted file formats: jpg, png, & pdf. If I run out of your 1st choice, what's your 2nd choice? 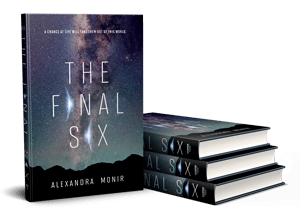 SUBSCRIBER REWARD: Do you want your name in Alexandra's next book? Subscribe to Alexandra's newsletter for a chance to win your name in her next book! Plus, you'll stay up to date on all the latest book news, movie updates, and events. You must pre-order a hardcover or eBook copy before March 6, 2018 to be eligible to receive the pre-order gift. You must upload your proof of purchase to be eligible. This can include a photograph, screenshot, scan, or copy of your original sales receipt. A picture of the book itself does not qualify. You can order from any retailer (direct links can be found above). If you don’t want to order online, most indie bookstores (as well as Barnes & Noble) will take pre-orders over the phone or in-store. Just ask a sales representative at your favorite store! Limited to one prize pack per person. Fill out the form above and be sure to upload an image of your receipt. We unfortunately don’t have the time to contact people individually to confirm receipt. If the form submission goes through without any issues or email bounce-backs, it’s safe to assume you’re good to go! 🙂 We’ll be sure to reach out to you if we need additional information. As long as there’s no issue with your submission, you can expect to receive your gift by end of March or early April. IF I ALSO PRE-ORDER A COPY FOR A FRIEND, DO WE EACH GET A PRIZE PACK? Yes. However, your friend will need to fill out the form and submit their proof of purchase separately. HOW WILL YOU CHOOSE WHO WINS THE GRAND PRIZE VISIT FROM ALEXANDRA? We will hold a random drawing. First we will compile a list of every person in the U.S. who successfully completes the form above and we’ll upload their names into a list randomizer on random.org. Then we’ll use their software to pick the winner! HOW WILL YOU CHOOSE WHO GETS THEIR NAMES IN ALEXANDRA’S NEXT BOOK? We will hold a random drawing. First we will compile a list of every person who checks the newsletter subscription box in the form above and upload their names into a list randomizer on random.org. Then we’ll use their software to pick 2 winners! If you have any further questions or you notice an issue with this website or submission form, please email my web designer or shoot her a tweet at @RylSocialMedia.